A People's Injunction will be posted today, (May 23, 2018) at 5:30 pm at the entry gate to the Kinder Morgan Westridge Marine Terminal at 7065 Bayview Drive in Burnaby by residents of the surrounding area. 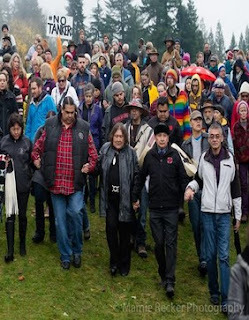 The injunction, signed by some 200 local residents, orders Kinder Morgan to cease and desist all Trans Mountain Pipeline expansion construction work by midnight on May 31. It will be enforced by local residents. Beginning on the morning of Friday, June 1, construction vehicles, supplies, equipment and workers will be prevented from entering the site. Justin Trudeau Brigade member Earle Peach is clear that vehicles will be stopped as they were beginning November 30 until the BC Supreme Court issued its injunction against interference with Kinder Morgan's construction on March 15. The same local residents who stopped construction during those 14 weeks will return and will be joined by others. "Under normal operation, if expanded, the pipeline will increase pollutants and interfere with the lives of endangered species (e.g. Orca). I do not want to open up my town to a catastrophic spill/accident. The profits go to a foreign corporation, while risk remains in my backyard. The oil industry is poised to decline; peak oil is upon us, oil is not the future. Climate change is real, fossil fuel use must be replaced. The process violates democracy and indigenous rights." ​"Kinder Morgan said it was ending all non-essential work and would make a decision by May 31 whether or not to resume. They have not stopped anything but have continued pile driving and site prep. May 31 is the deadline. As Prime Minister Justin Trudeau has said, 'Governments grant permits, only communities grant permission.' Regardless of what Trudeau's government does, we in this community do not grant permission," according to Thomas Chan, a Burnaby resident.